The weekly Aldi meat special is extraordinarly impressive this week, as you can get boneless, skinless chicken breast at $1.69/lb this week. 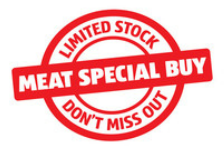 The weekly Meat Special Buy starts on Wednesday (October 19th), and it seems to be running at all Aldi stores. I will definitely be stocking up on Aldi chicken this week! There is only a limited supply of this meat product, so this might not be available all week.